New zoning and development on campus. Rendering courtesy Stevens Institute of Technology. Preserving Hudson River views, allowing taller structures, and protecting historic buildings might seem like difficult tasks to accomplish together, but officials in the Mile Square City hope they have done just that by approving a new zoning scheme for the growing campus of Stevens Institute of Technology. On August 15, the city council voted 7-1 to approve the creation of the University District, which encompasses 36 acres of land Stevens owns on a hillside. Before the changes were made, most of the campus was zoned to allow a maximum height of 100 feet, or about 10 stories. The new district breaks the institute down into four different zones: Transition Sub-Area, Core Sub-Area, Edge Sub-Area, and Castle Point Sub Area. New zones. 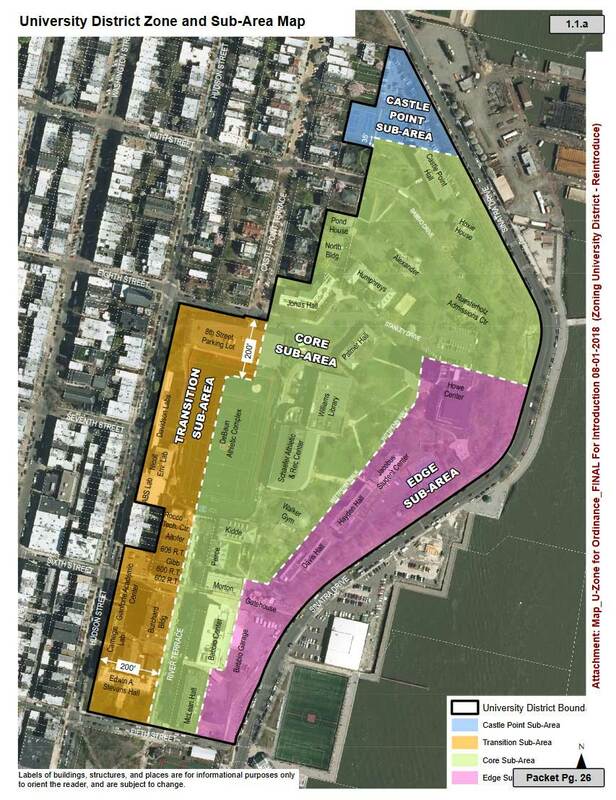 Map via Hoboken City Council. The Transition Sub-Area borders Hudson Street’s residential brownstones and limits height to 40 feet and not more than four stories. The Core Sub-Area, the largest zone, maintains height maximums at ten stories and 120 feet, while the Castle Point Sub Area, the most restrictive section, limits use of the land to athletic facilities and accessory uses like surface parking facilities. The biggest change in the plan that will have the quickest impact is the Edge Sub-Area, which was created to accommodate development of taller structures in a portion of the campus that is furthest removed from residential neighborhoods, thus minimizing the impact of height. New buildings can rise as tall as 160 feet under the plan with one exception — a property currently housing Jacobus and Hayden Halls. That land is likely to house a new Student Center, which will replace the modest two- and three-story brick structures with a pair of glass-enclosed residence halls atop a state-of-the-art, 75,000-square-foot university center. Rising about 222 feet at the highest point and drawn up by Baltimore-based Design Collective, the 21- and 19-story towers will be linked by a breezeway and can accommodate approximately 1,000 beds. In addition, a new fitness center, student and faculty lounges, conference center, a new food service and dining venue, a C-store, new space for student organizations, and office space are included in the building. Per regulations in the University District, the Student Center must attain a minimum LEED Silver certification. The application for the project is slated to go before the planning board’s Subdivision and Site Plan Committee on September 12, and officials at Stevens have stated they hope to open the new building in the fall of 2021. Stevens also has intentions for an academic building rising 160 feet at 5th Street and Sinatra Drive and another project dubbed Castle Point Apartments at the northern end of the campus that could rise as high as 120 feet, but both those endeavors will happen sometime after 2024. Despite all the new construction, Stevens supports expanding the existing Castle Point Historic District to include both sides of Castle Point Terrace on their campus and has agreed to nominate six of their properties to the National Historic Register including the Gatehouse, the Carnegie Laboratory, and 600-602 River Terrace. Separately, the city council is moving forward with another resolution that could create the Waterfront Open Space District. Encompassing a section of land that Stevens owns along Sinatra Drive but excluding the Union Dry Dock site, it aims to preserve open space and facilitate water-oriented recreational facilities on a stretch that currently consists of mostly surface parking. As currently written, any new structures would be limited to 35 feet in height, or two stories. Public parks, plazas, temporary food vendors, maritime research and academic facilities, athletic fields, piers, and docks would be encouraged under the plan, while allowable conditional uses in the zone include restaurants of the fixed or floating variety, event or catering facilities, and even a possible floating pool that would need to be open to the general public. In the short term, renderings from a presentation made by Stevens to officials indicate they have plans for a Maritime Research and Innovation Center plus a tennis pavilion at the property. The Waterfront Open Space District was pulled from the August 15 agenda per the request of sponsor Councilman Michael DeFusco, but he says the matter will likely be back on the agenda sometime in September. New zoning and development on campus. Map courtesy Stevens Institute of Technology. This is great news for Stevens and for Hoboken. Stevens is a world class institute that will finally get some much needed added beds on campus, thereby reducing the need to House students and run shuttles throughout Hoboken. My only regret is they’re not going to be able to build as high or as quickly as I would like. Congratulations, Stevens and finally well done council members. The dorm buildings as pictured are generic and hopefully the actual architecture is befitting Steven’s world class aspirations.